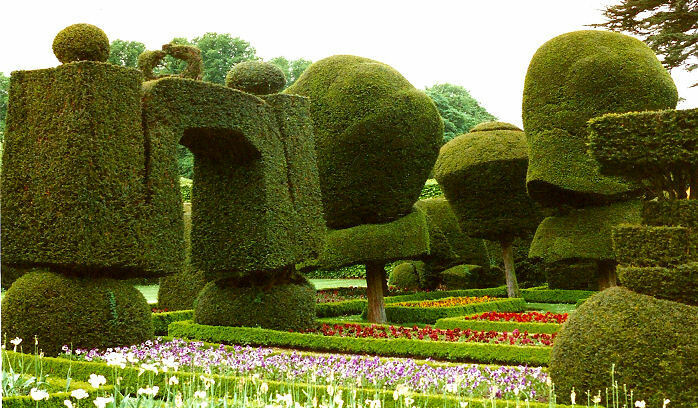 Levens Hall, Kendal, Cumbria, LA8 0PD. 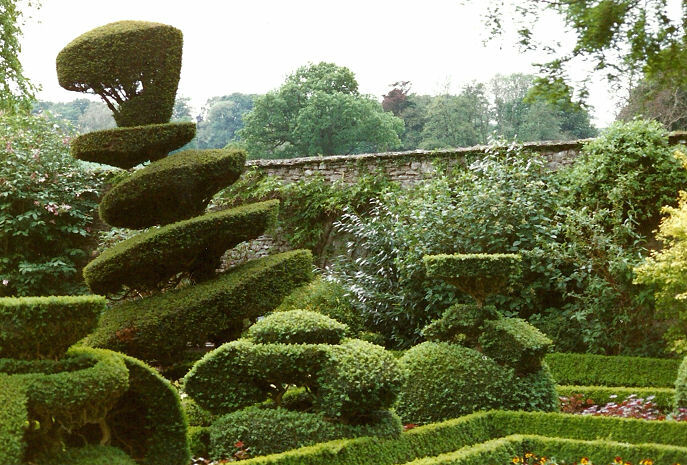 As major religions have their Mecca or Rome, Topiary has Levens Hall. If you are at all interested in the art, first visit to Levens near Kendal, a stones throw from the Lake District National Park, will make you run about like a new born puppy. 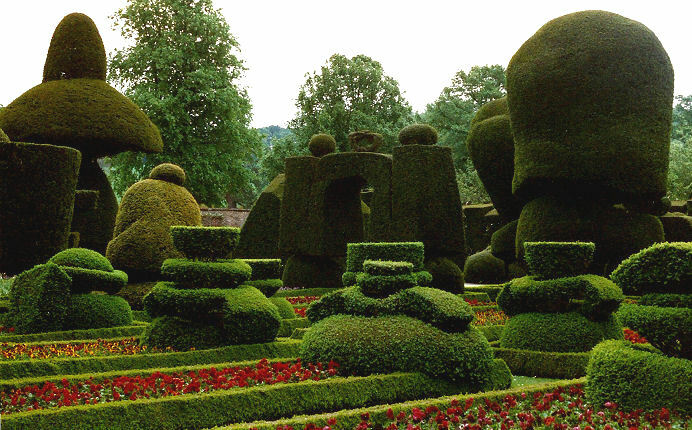 The fact that many gardens once looked like is not surprising. That Lancelot “Capability” Brown and his fashionable landscape vandals tearing up gardens to create parkland missed only one, is. In 1688 Colonel James Grahme, onetime Keeper of the Privy Purse to King James the Second bought, or won at cards, the estate and set about designing a new garden. The Frenchman Guillame Beaumont was appointed as garden designer. He had already tried his hand at Hampton Court Palace and been responsible for designing other English gardens but it is only here at Levens that hiswork remains. Some think he was a pupil of that other French Garden Master Le Notre and at any rate the gardens show his influence but they are a world apart from the formal French gardens of the period. Levens was a tourist attraction form the early days and people regularly wrote to Beaumont, who lived on the estate to come and visit it. It is likely that many of the specimens still date from that time but there have been additions and renovations over the years especially during the reign of Victoria. 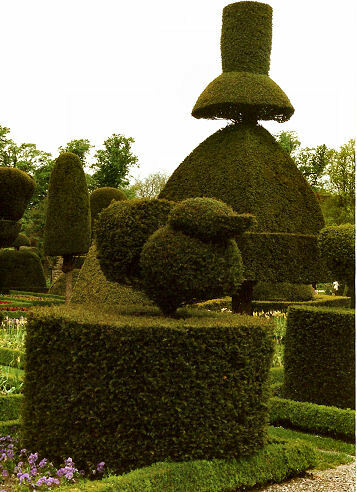 The great age and maturity of the Topiary has given them a design all of their own as the trees have forced their wills upon the gardeners. 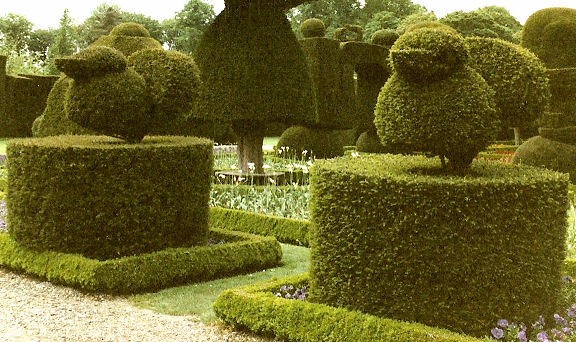 The Box border hedges are still clipped by hand by a small army of gardeners and although clipping of the Yews starts in late summer it can be well into December before the final cuts have been made. Many of the pieces have names such as “Queen Elizabeth and her Maids of Honour”, The “Judges Wig”, the “Bellingham Lion” and the Jugs of “Morocco”, a potent Brew which was once drunk at annual raucous Radish Feast held each May and instigated by Grahme. 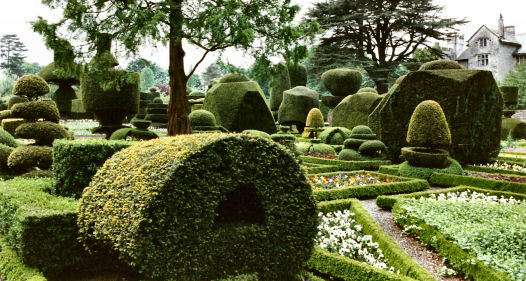 Oh, and by the way there is an Elizabethan House to look at and other gardens besides, should you ever tire of the Topiary, but then as you are reading this I’m sure you won’t.